Synopsis: Continuing on from where we left off in the previous chapter, Nagi and Athena are now eating shaved ice while discussing the King's Jewel thing -- and they are surprisingly in sync with each other! Finally! I can get down to my seryaz buzinezz! 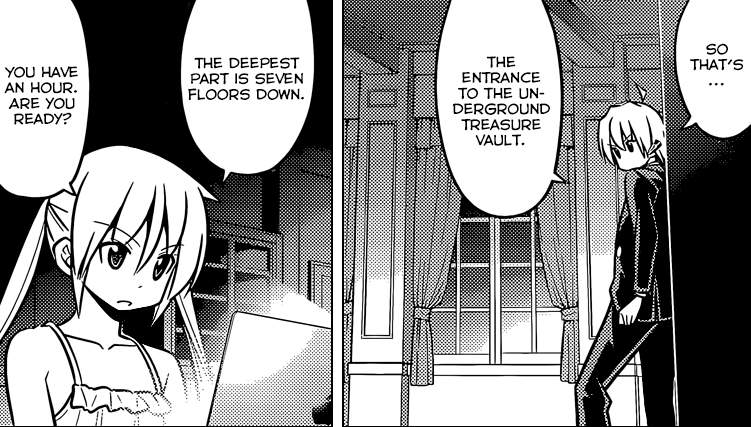 They discuss the possibility that Mikado could be hiding a King's Jewel inside his castle all while Hayate is absolutely clueless as to what is going on. Finally, it's decided that taking the King's Jewel that Mikado has and presenting it to him is a good way to win back Nagi's inheritance because it's not stealing at all! It's just being kind! Being smart is one of Nagi's main character traits. 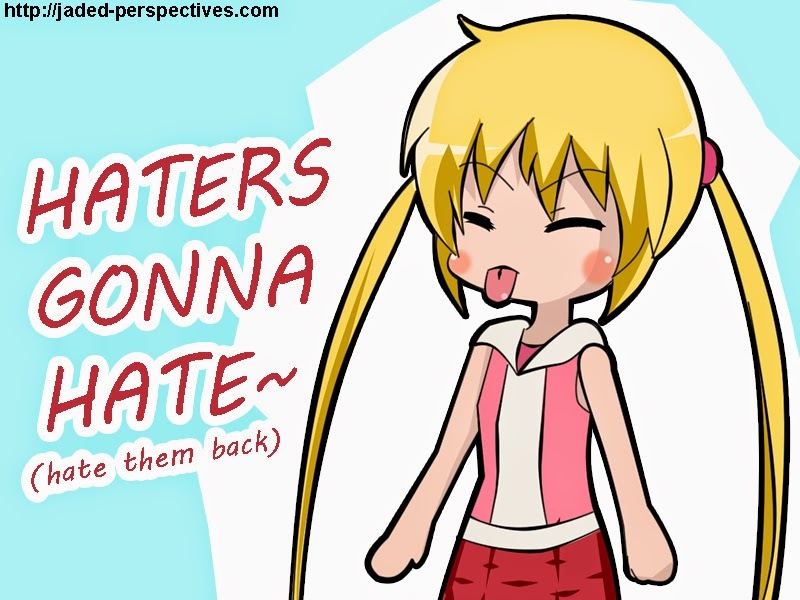 Accept it, haters! 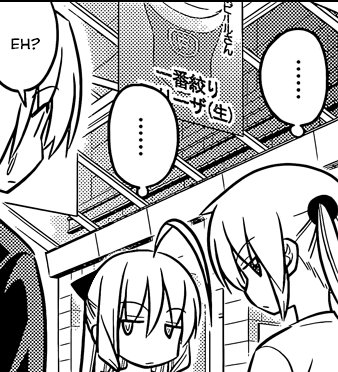 With that said, Nagi, Maria and Hayate pay Mikado a visit and put the plan into action. After a brief banter between Nagi and Mikado, she pretends to get all sulky after one of her Grandfather's usual pokes and says she's going to her room for a nap and takes Hayate along with her. Girls: We got a slow one here. Keep up, butler boy! Anyway, we get a short cut-in of Maria explaining what this Manga is all about and that it's having its Tenth Year Anniversary this October (huzzah!). Nagi begins the haxxoring process and Hayate proceeds as planned. Of course, once he's in, Nagi can't get in contact with him anymore and after turning on his flashlight, he immediately activates some arrow deathtrap and almost gets killed. The chapter ends here. Review: Haha! I love how this series is really going back to its roots with the recent beach arc and now this chapter -- a combat butler comedy anime about a boy... who protects a girl... who is in love with him due to a misunderstanding (ok, maybe not so much about the misunderstanding anymore. She seems to have been aware of it for some time now)... and some maid who is apparently also a main character. 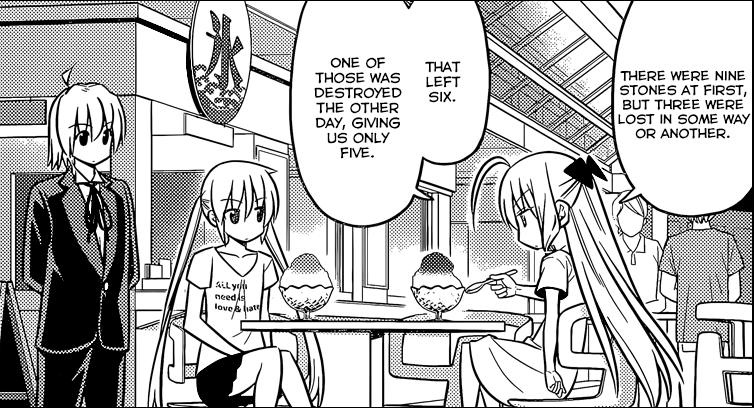 I'm also pretty stoked that all the flashbacks in the explanation panel are all Hayate x Nagi moments. Ten years of Hayate. Huzzah! Anyway, the highlight of this chapter for me would be the rare moment of Nagi and Athena talking in sync with each other -- especially since Athena was all set to stab Nagi with her Antenna hair in the previous chapter for purposely delaying the plot. I've really fallen in love with this manga (and Nagi in particular) ever since I picked it up just a little over a year ago and I think it's pretty amazing that it's going to be over a decade old soon. I realize that the plot might be a bit plodding for some of you at times, but personally, that's never been a problem for me. The King's Jewel story has never really been the main appeal of the series for me, because I've always liked it more for the interaction between Nagi and Hayate rather than the forced, sometimes cheesy King's Jewel plot. Butler and Master work together etc. etc. or whatever it is that Hata said in that one cover. Let me get this straight: I think that Hata can write a competent story, but dramatic narrative is not really his strongest point. For me, the Manga really shines when it's not taking itself so seriously while still allowing the plot to progress gradually in the background. To his credit, at least Hata's plot has been coherent and relatively consistent all throughout the manga's run -- though I would say that no matter what he says and even if it was seemingly foreshadowed, Athena's arcs felt really out of place in the manga. That doesn't mean I didn't like it -- it still ended with a Nagi flag after all. Also, I don't really feel the need to defend the manga for having derivative characters and plot -- because it really does. The thing is, there's really nothing wrong with that. Despite its characters being derivative of several archetypes, they have really come to grow into very distinctive personalities throughout the manga's run that it's pretty hard to confuse Nagi for example with Shana or any of the other Kugimiya tsunderes nor with otaku characters like Konata from Lucky Star. There's also Hamster who is so normal that there's no other anime character that I can think of who can out-normal her, not in a literal sense, of course. Of course, out of everyone, the real enigma for me is actually the titular character himself. 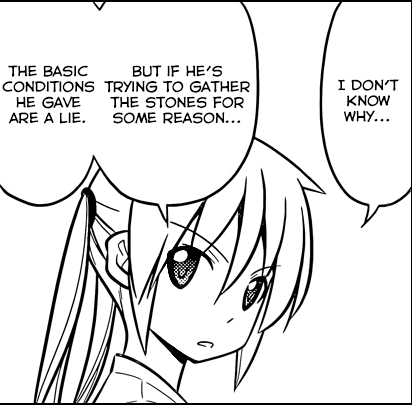 Hayate is really quite a mystery in that he manages to make himself seem very easy to read at times, while also maintaining a certain level of teenage angst about his past -- which leads him to make some strange decisions and declarations at times. Anyway, the manga can be as complex or as simple as you would like it to be, but as long as you read it with an open mind and avoid being overly critical, it's really a good read with a little bit of something for just about everyone.